As consultation with voters begins on whether the Welsh assembly should have full law-making powers, BBC Wales' political editor looks at how devolution has reached this point. 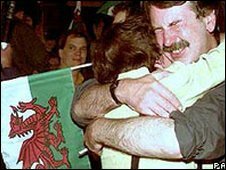 Early on 19 September 1997 Wales looked set to say No to the idea of its own assembly, a second rejection in 18 years. Scotland had shouted a resounding Yes a week earlier but as the results from the 22 Welsh counties came into the counting centre at the Welsh College of Music and Drama in Cardiff, Wales seemed set to reject yet more politicians, rather than Yes to making its own decisions about its own future. Before each result - starting with a No from Wrexham - came an interminably long jingle. After each result the Yes campaigners looked just that little bit more defeated. I was working for Radio 5, trying to spot Welsh Secretary Ron Davies and herd him to our table. He wasn't around very much - what we took to be a bad sign in itself. Welsh Office minister Peter Hain arrived looking grim, as did Plaid Cymru leader Dafydd Wigley. They both spoke of the difficulties the government and Yes campaigners had faced. It looked, felt, smelt like a No. Would that have been a surprise? No. Labour had been elected to government in May 1997 having been out of power for 18 years. Prime Minister Tony Blair had promised to hit the ground running. He enthusiastically announced that he was giving the Bank of England the power to set interest rates and perhaps rather less enthusiastically honoured a pledge by his predecessor as leader, John Smith, to offer a referendum on devolution in Scotland and Wales. No-one doubted that Scotland would say Yes. It had said Yes in 1979, after all, but by too slim a majority. Wales hadn't just said No. It had said No with a vengeance: 80% to 20%. Eighteen years later Yes campaigners knew they had a mountain to climb. Despite all the main parties - except the Conservatives - working together for a Yes vote, plenty of seasoned campaigners thought they were about to lose. The polling booths were quiet. Just about 50% turned out to vote. The fax machine which spewed results out for Professor Eric Sunderland to read, was just out of my reach. "Go on. Lean over and take a peek" said Eddie Mair live on air. I didn't dare, but by the time the final page of the final count to be declared - Carmarthenshire - appeared, a kind, rather elated soul had already stuck the result under my nose. He'd even done the maths: 50.1% wanted a Welsh assembly, while 49.7% did not. The ayes had it and ran with it. 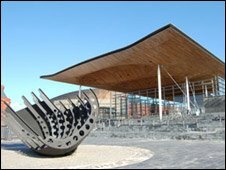 The National Assembly for Wales was created by the Government of Wales Act 1998. In 1999 the first Assembly Members were elected. Wales had its own elected government, its own civil service in the making. The first act of devolution was to transfer the collection of powers already devolved from Whitehall to the Welsh Office to the assembly. It had no powers to bring about primary legislation - it couldn't make its own Welsh laws. Then in 2006 came another Government of Wales Act. Although the assembly government had responsibility over the same areas of policy as before - areas like health, education, economic development, local government funding, rural affairs - over time the new act allowed further powers to be devolved, after specific requests have been approved by both houses of Parliament. "Devolution-lite" say those like Plaid's Adam Price MP who want full Scottish-style powers and for Wales to be able to make decisions without the say-so of Parliament. 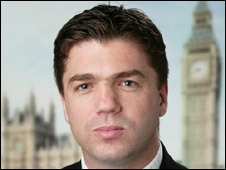 A case of the United Kingdom "being slowly dismembered and hollowed-out in full view, and with the tacit consent, of the political classes" says Conservative MP Stephen Crabb. He doesn't argue for the abolition of the assembly because it "is not currently saleable", but he would not want Wales to vote Yes in the next referendum, when it comes. Next referendum? Ah, yes. Enshrined in the Government of Wales Act 2006 was the prospect of Wales achieving a parliament more like Scotland's - subject to another referendum. This week the executive committee of the All Wales Convention will kick-start its journey around the country listening, gauging, engaging as it goes. It is in the process of explaining to us all the present system of powers available to the assembly, while at the same time gauging whether Wales wants a chance to grant its assembly more powers. By now the man at the helm, Sir Emyr Jones Parry, the former UK ambassador to the United Nations, will know back to front how we voted in 1979. He'll know how we voted and even perhaps why we voted as we did in 1997. By the end of the year his job will be to tell the Welsh Assembly Government how he thinks we would vote in a referendum held on or before May 2011 - and why. The All Wales Convention will hold the first of a series of public consultation meetings at the Seaside Social and Labour Club in Port Talbot on Wednesday, 14 January, (1830 - 2030 GMT). There will be similar events in all Welsh counties, ending in Cardiff in June.